Every spoiled doll needs a playroom, and this one was great fun to make! Normally I would not use gold paint as an accent, but this gilding was inspired by Downton Abbey ;). This Grand roombox kit from Houseworks is the perfect scale for tiny BJDs, dollhouse miniature dolls and other small dolls. The room is giant! And assembly is a piece of cake. Fit the pieces into the slots so you understand how the box is constructed, but don't use glue yet. This (below) is how thick the walls are! This is a very sturdy box. As you can see below, the assembly instructions are just a single page and are quite simple. I did not do all the business with the taping of the walls when I assembled mine because by that point, the walls and I were good old friends and I couldn't forget what went where if I wanted to. Also, with the exception of the two smaller walls, all other walls are shaped differently and can only fit in the floor grooves they are meant for. Most of the construction and prep work should be done before the box is assembled. This way you can use the walls and floors to take measurements and cut wood/paper/fabrics to size. Let's begin with the floor. 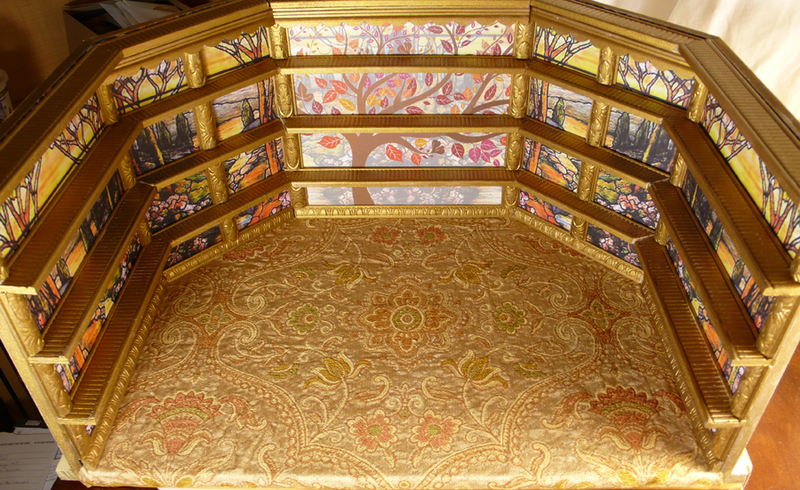 I chose a brocade fabric to resemble a finely detailed rug. You could also use plush fabrics like velour to give a carpeted look, or you can use paint/paper/vinyl to create a hard floor. To cut the fabric to size, first I laid the piece out on my floor. I then wrapped the fabric ends around the edges of the floor so I could center my design. Once the design is in place, use sharp scissors to cut the fabric out using the inner floor grooves as a guide. If cutting into the fabric is scary, you can first make a floor pattern by taping sheets of paper together. Brocade type fabrics tend to unravel rather profusely around the edges, so I used a hefty amount of Fray Check on the edges to keep them in line. Notice how with the front of the carpet, I left it folded around the front of the floor--this fold will provide your box with a cleaner front edge. Okay, don't glue that carpet in place quite yet, we've got more prep work to do! For the walls I used some clip art I bought online as well as some free clipart from Dover publications. I edited these images in Photoshop and then saved them to a jumpdrive. Now you could also just use scrapbook paper, art paper, paint or fabric for your wall coverings. These below are the wood trims I used to create the shelving. These are 1 yard lengths purchased in the wood craft section of a Michael's craft store. I used 1 yard scalloped edge (top trim), 3 yards small floral (shelf braces), 5-6 yards of the slat board trim (shelves) and 2 yards of the loopy U's trim (baseboard). I have no idea what the real names are, but hopefully you can see the differences as we move along. First, I decide how many shelves the room should have. I gauge the scale using the types of toys I intend to put on the shelves. in this case, 4 seems like a good number. Below: the slatboard trims turned on their sides. Okay, to cut the shelving, you will need to saw at an angle. I have a small mitre box, but the angles in the box did not match the angles I needed. So, instead I used the roombox floor to measure out the shelf lengths and angles. Below: See how the pencil line is the same angle as the corner floor line? You want to measure out all of the pieces this way. You want to get these measurements as close as you can, but don't worry too much if they are slightly off. You can correct edges with sandpaper and/or use putty to fill in gaps later. Here is my progress as I cut each shelf piece using the floor as my measurement and angle guide. To have four shelves, I have actually cut 20 pieces of wood with my itty bitty saw. If you are cutting a lot of pieces, you can build a little guide for yourself to hold the wood steady. The pieces you see below are the braces for between the shelves. To find the brace length, I took the wall height, subtracted the height of all four shelves, floor groove height and the baseboard and then divided the total by 4. There are 32 brace pieces total. (Remember that the wall sits in a grooved channel, so subtract that height as well.) I use mm to make these measurements as they make precision easier. By the way, the little vinyl bricks here are just part of an old project--I am using this large board as a scrap board to saw/paint over. I also found the houseworks kit box quite handy as a work surface. Cut the baseboard trim and scalloped pieces as well before you move on. You will have about 60 little pieces of wood. Now I paint each one--I only paint the sides that will be visible--if you leave the backside bare, it will help the wood make a stronger glue bond when you assemble the shelves. I only use one coat of the gold paint as it is fairly thick. Now it is time for some wallpapering! (Note: In the image below, the carpet is not glued down--it is just set in place for planning purposes.) To paper the walls I used Acrylic Matte Gel Medium on the backsides of the papers and Acrylic varnish for the front. You could probably also use something like ModPodge at a lower cost, but I like that the Acrylic mediums are designed to provide your art with longevity, so will help protect against fading over time. Okay, if we look at the walls from right to left, with left being number 1 and far right being number 5, I apply paper to walls 1, 3, and 5 only. Walls 2 and 4 (the shorter walls) will be covered later to help blend all the paper seams together so that the papers can overlap slightly. As you probably guessed, I used the walls to measure the paper cuts. Use Crafter's Pick The Ultimate white tacky glue to glue the walls in place. Make sure to coat all connecting walls with glue, including the floor grooves. Allow the box walls to dry thoroughly and check them periodically for any slumping or crookedness. I painted the outside of the box while waiting for the wall glue to dry. Finish papering the walls and make sure they are coated with protective mediums inside and out. 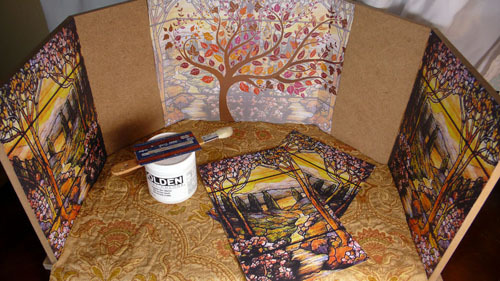 The mediums like acrylic gel medium or ModPodge act as both glue and coating. Okay, now that the walls are in place, we can glue the carpet down! For the carpet, I used Fabri-tac glue. Set your floor in place and lift the area furthest from you--apply glue along the back walls and lay the carpet in place. Next, lift the carpet from the front side and finish coating the floor with glue, pushing the carpet down toward you as you work back and fourth (think typewriter). Once you reach the front end, you can apply more glue to the edge of the carpet and then fold it around the bottom of the box for a nice, clean edge. Okay, on to baseboard! The baseboard is a triangular piece of trim that helps cover the connecting seams between the walls and carpet. I use Crafter's Pick "The Ultimate" to glue the trim in place. Once the trims are in place, I use the same glue to set the adhere the shelf supports. If you look at the pictures, you will see I have used 8 support pieces per row. These pieces will help the shelves stay even and will make gluing the shelves much easier as it provides support in between dry times. Once the first row of supports are in place, glue the first row of shelves to the wall and supports. Make sure all surfaces that touch are coated with glue for a strong bond. I did not wait for the glue to dry in between layers--I didn't have to as the shelves and supports held together nicely. Below is a close-up so you can see that my cuts are not perfect. Some of the wood pieces had gaps and some required sanding for proper fit. If the gaps bother you, simply fill them in with wood putty or apoxie sculpt once the shelf glue has dried. Then you can go back over the filled areas with a bit of matching paint. Once I reach the top shelf, I add my scalloped trim along the bottom of the back three walls for some extra zing. Now this giant room is ready for toys and spoiled dolls! Over the next few months, I will share what I decide to fill this room with ;). Want free doll projects in your inbox every first Friday of the month? Sign up for my dollproject email newsletter. Note: this post contains some affiliate links to products I use and recommend.